JOHANNESBURG – The use of virtual reality (VR) technologies in the South African mining industry has grown considerably over the last year, particularly on the back of the University of Pretoria (UP) opening its R50-million Kumba Iron Ore Virtual Reality Centre for Mine Design. He adds that, instead of communicating in words, pictures or video clips, VR enables people to communicate in a new-age language of ‘seeing is believing’. Local 3D-simulation technology provider Simulated Training Solutions (STS) MD Wilhelm Prinsloo tells Mining Weekly that it is critical for mineworkers to understand cause and effect when they are dealing with hazards, particularly in underground operations. It is difficult to recreate mining conditions in a classroom setting, but using 3D simulated images creates an authentic experience of mining conditions and scenarios, which provides users with a sense of being immersed in the mining experience. “This enables users to . . . react to certain hazards, which, in turn, enables them to learn from their mistakes and prevent them from occurring in actual situations,” Prinsloo says. VR technologies are also significantly cheaper than building mock-up mines to train employees and more versatile, as the images can be redesigned according to the changes required by a company. 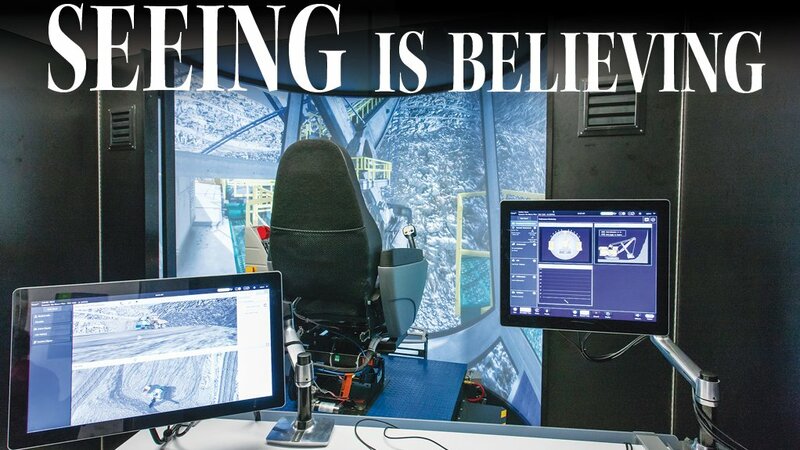 VR can also be used to better mining yields by improving blast and drill rates through the simulation of different patterns, which will help engineers identify what works best. STS product development manager Johan Bouwer notes that VR technology can slow down a blast sequence to one-millionth of the real-time speed, which “is almost impossible in real-time blasts, as there is too much dust and debris to see clearly what happens during and after the blast”. Webber-Youngman explains that the difference between VR and augmented reality (AR) is that the latter blends holographic projections with reality, thereby creating an augmented perception of reality, with objects appearing to be there, but which are not really there. VR, however, creates a new immersed environment while shutting out reality. One of the latest AR inventions is multinational technology company Microsoft Corporation’s HoloLens, of which a prototype was released in January 2015. It is the first fully untethered, see-through holographic computer that enables high-definition holograms to come to life, seamlessly integrating with a user’s physical spaces and items. Microsoft describes this experience as a “mixed reality, whereby holograms are [intertwined] with a user’s real world to unlock new ways to create, communicate, work and play”. Lane points out that VR has existed since the 1960s, but it was not accessible to mainstream business because companies required a high level of research and development in terms of the technical ability to use it. However, he adds that it has since become significantly more accessible to companies, with social networking company Facebook buying US VR technology company Oculus VR – the developers of the Oculus Rift, a VR head-mounted display system – in 2014. Other technology companies, such as Samsung and Sony, have since developed their own VR hardware. “These developments have created new opportunities, particularly for mining, which is a highly complex industry, as, in many instances, one needs to be immersed in the mining environment to gain an appreciation of what is actually happening,” reasons Lane. Through the use of VR headsets, people in different parts of the world can walk through a virtual mine site together and assess a mine plan. Lane expects that, in the next two to three years, this will become standard practice, owing to rapid technological developments. “With Microsoft and multinational technology company Google working on AR technologies, this will undoubtedly also trickle down to the mining industry in the not-too-distant future,” he asserts. African Appreciation Lane notes that UP’s VR centre is providing future mine planners with new tools to visualise a mine plan before implementing it and, therefore, ensuring better mine designs. It is also providing students with a better understanding of how VR technologies can be integrated into the mining industry to improve performance and health and safety standards. “Mines can also partner with UP on selected projects using VR, which will certainly assist [them] in developing a better understanding of VR and its importance to the industry, thereby acting as a catalyst for greater VR use in mining.” Lane also cites mining major Anglo American’s Centre for Experiential Learning (CEL), in Crown Mines, Gauteng, as an “excellent” example of a mining company using VR to train and educate staff. The CEL is a dedicated in-house training facility, supporting operating-model skills development. It is targeted at managerial and supervisory levels, and is operated as a professional adult learning institute, where teams learn to apply operating-model tools using a combination of VR, modelling and real-time scenarios. However, Lane stresses that VR should not be regarded as a technology that only major mining operations can afford. Oculus Rift and computer software developer Unity Technologies’ cross-platform game engine, Unity, offers cost-effective VR capabilities that junior and midtier miners can access to implement VR modelling and design. STS has provided VR training material and training for local platinum miners over the last decade, Prinsloo highlights, adding that the local gold, coal and chrome industries are also increasingly using VR in their operations. STS has recorded a marked increase in the sales of VR programmes in South Africa, allowing for the reconstruction of events that have resulted in injuries and fatalities at mines. Sales have also increased in Australia, Chile, the Democratic Republic of Congo, Zambia and Iraqi Kurdistan over the last two years. Reconstructed incidents are providing mining executives – who do not always have a background in the mining industry – with a better understanding of the hazards that workers face, thereby enabling management to allocate resources accordingly to improve working conditions, Prinsloo says. He tells Mining Weekly that STS has commissioned a VR prototype unit at a coal mine in South Africa and is also in discussions with a Zambian mining house to build a VR prototype unit for its mines. But cost pressures are hindering the growth of VR use, particularly in mining, says Prinsloo, while Lane adds that mining companies have generally not been at the forefront of new technology adoption. Change is occurring, however, says Lane.